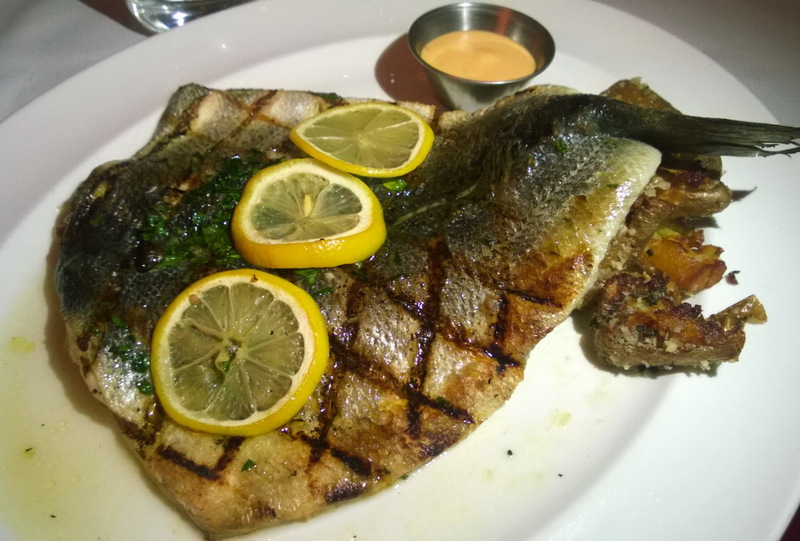 A review of the new Catch seafood restaurant which opened in downtown Red Bank, on Broad St. It's sure to delight its customers with the market-style choice of fish, including Chilean Sea Bass, bronzini, salmon, red snapper and much more. Catch also serves amazing appetizers and desserts. We finally made it to Catch, which opened on Broad St in Red Bank at the end of 2014, replacing Blue Water Seafood. Maintaining the seafood theme, this looks like an upgrade of the old place, managed by Joseph Squillaro (owner of the also new Gotham lounge, a few buildings down) and engineered by executive chef Dominic Rizzo. Fish-lovers should be delighted in the market-style setup, where the main attraction on the menu is not a set entree, but a make-your-own combination of several catch-of-the-day fish, with the side and sauce of choice. Downstairs there’s a raw bar and an open kitchen where diners can interact with the cooks, while upstairs there’s a more private dining room. There’s a variety of appetizers, everything from lobster and mussels to calamari, crab cakes or shrimp, but we skipped to the entree. 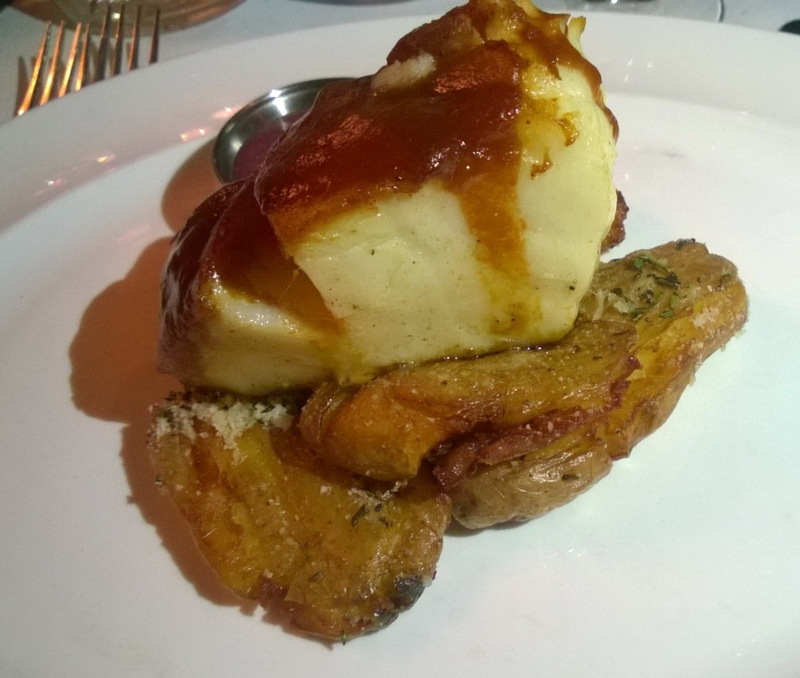 I picked something from the menu – the Sweet & Tangy Chilean Sea Bass, which was outstanding. The meat couldn’t be any more tender, and the pineapple glaze and yuzu-berry drizzle enhanced the flavor. The crispy potatoes were a great complement. I also tasted some the other dishes from our table, which were from the “fresh catch” menu (so these items might change over time). The pan-seared bronzini was extremely good and perfectly cooked. The fish was split along the middle, with the bones taken out, so it was like a whole-fish filet. A sizeable portion, but one that you couldn’t stop eating. 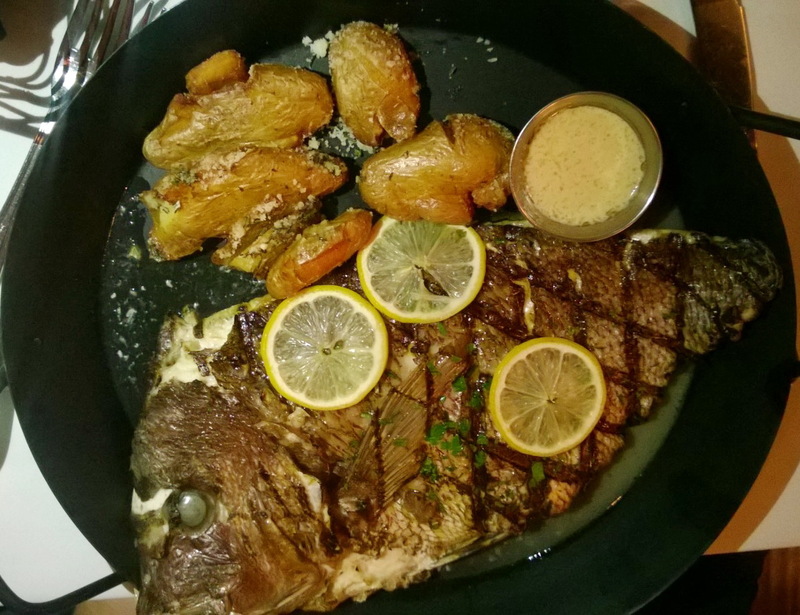 There was also a whole red snapper, which was so well prepared that meat would come right off the bones. 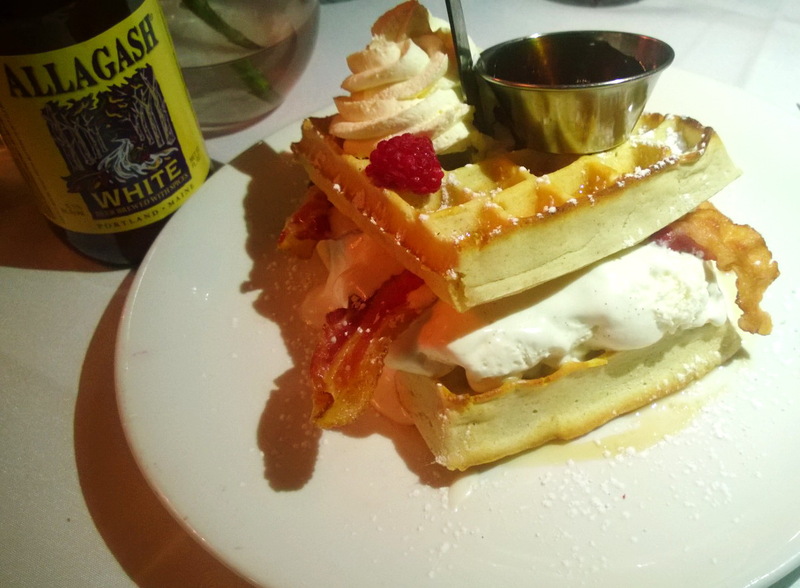 I’m glad I skipped the appetizers and left room for dessert, which was an unexpected treat: a waffle icecream & bacon sandwich! If I had any doubts about being able to have dessert after all that fish, the very helpful server had me at “bacon”. Or was it “icecream”? The crispy bacon covered in soft icecream and sandwiched between perfectly toasted waffles was one of the best and most creative desserts I’ve ever had. Catch is a great new addition to the Red Bank restaurant scene, and I strongly recommend it if you’re in the mood for good seafood. It’s BYOB and on the busiest weekends a reservation is recommended.